In other words, London’s bike superhighways are incredibly successful, as the front-page GOOD story remarks. According to the findings in study by Transport for London, there were 70% more cyclists out on the streets of London in October of 2010 than there were the previous year. that means that the number of bikers on the streets pre-superhighways was 70 percent lower than it is now that the superhighways have been installed. That’s some effective bike promotion, if I’ve ever seen it … Will other cities see this information and start doing more for bike lane planning than simply laying them on the side of the street? That’s right — bike use everywhere jumped, not just on the superhighways. The safe, elegant lanes evidently inspired more folks to dust off their old ten-speeds and hit the roads. It should also be pointed out that the spike in cycling also coincides with London’s bike-share program, which we’ve written about at length here on TreeHugger. This development is fantastic — people want to ride bikes in cities. It’s cheap, efficient, and fun. But most of the time, it’s terrifying. It’s why I don’t ride a bike in New York — no way I’m heading into Manhattan traffic during rush hour. 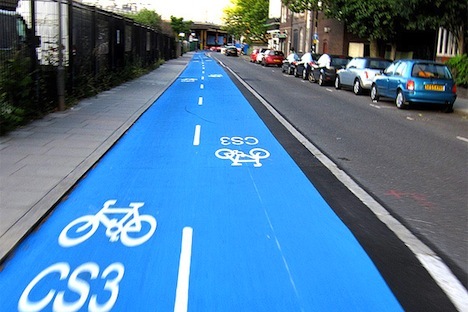 New York is also making strides in its bike lanes, too, however. If they work as well as London’s, that’s all it will take — count me in.